ran from Saturday Feb. 17- Monday Feb. 19. 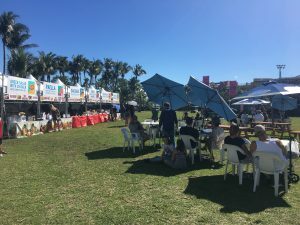 Located right on Bayshore Drive in the Grove, the street was packed to the brim with people all there to appreciate some very expensive art for sale, fill up on food, and relax in the shade while music blared from the stage. The festival was a hub for popular artists to showcase their talents on a local scale. With art ranging from $2,000 to $19,000 a piece, it was definitely a sight for sore eyes. Wandering the festival was a spectacle, the art unimaginable. An eye-catching tent packed with sculptures made from used junk attracted all the mechanic enthusiast. Eclectically colored woven glass at another tent glistened in the sweltering sun. From tent to tent, visitors could explore many new tastes in art and get to know artists on a more personal level. If art wasn’t your thing, the festival had more food than could feed an army. With arepas and frozen lemonade stands every five feet, festival-goers could get their fix and still cool themselves down afterwards with the popular chilling drink. Food trucks lined up opposite the tents made for the perfect set up for people to eat and look, and eat and look some more. 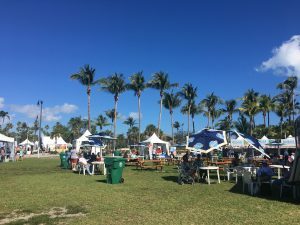 On top of the energy from buzzing art lovers, the Coconut Grove Arts Festival had a stage set up with bars surrounding it for people to sit and enjoy some classic funky tunes, while sipping down a mojito, as well. 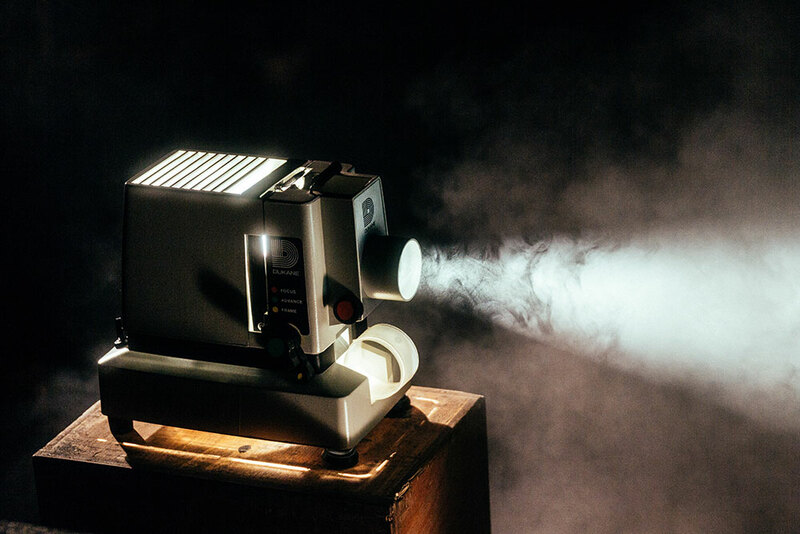 The DJ’s playlist included songs like “Never Gonna Give You Up” by Rick Astley and “Stayin’ Alive” by the Bee Gees, adding retro vibes to the modern aesthetic of the art. 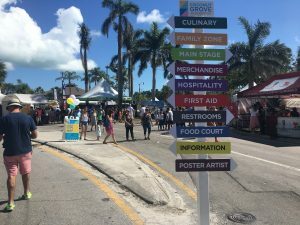 For something to do on a weekend in Miami, the Coconut Grove Arts Festival was definitely the spot to be for anyone who enjoys appreciating art, food, and music. As per the artists request, the art was not allowed to be photographed.